Your store, boutique or business represents your brand power images to shoppers. Clean facilities, dust-free surfaces, and shiny floors can help create a positive client experience and boost your business reputation. clients are more likely to visit your store again and recommend your workplace if you have clean, odor-free washrooms. 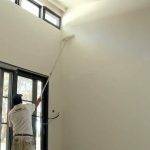 Hygienic cleaning is a combination of using the right techniques and correct tools to remove soil. Your store or business is a visible representation of your brand image to shoppers. Clean facilities, dust-free surfaces, and floors that shine can help create a positive customer experience and boost the reputation of your business. Clients are much more likely to visit your store again and recommend your workplace if you have neat clean, odor-free restrooms. 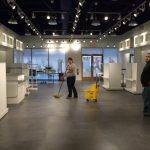 It is important to dust and disinfect the surfaces that are often overlooked by other retail cleaning companies. You see the same tables and shelves every day, so you might not notice when they get a little dirty. But, your clients do. The Menage Total Program pays special attention to glass and other surfaces that get dusty and dirty on a daily basis, so your customers can focus on shopping. Frequently touched surfaces in high traffic retail facilities can be a source of harmful germs that spread illness and infection from person to person. Doorknobs, tables, and counters are touched by many customers throughout a typical shopping day. The Menage Total Cleaning Program focuses on these high-touch points and can help stop bacteria and germs from spreading. Menage Total Franchised Businesses provide commercial office cleaning services to commercial and professional offices that need a better, consistent office cleaning program. Office environments require thorough dusting and disinfecting, vacuuming, mopping, restroom cleaning and trash removal. Killing and removing germs to create a cleaner and healthier workplace are important to help reduce the spread of illness and infection. 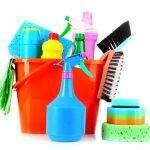 A clean facility makes a good impression on employees and visitors. Menage Total franchised commercial office cleaning services are provided by local, independently owned and operated franchised businesses trained and certified to use Menage Total Program processes and brand. People spend time at your facility to get healthy. But, how clean and healthy is your fitness center, gym or spa? A clean facility can differentiate your business and keep members coming back. Smelly locker rooms, sticky equipment, and dirty floors are a turn-off. Plus, warm, moist environments are ideal homes for bacteria, fungus, and other illness-causing germs. With many people touching the same surfaces throughout the day, your fitness center, gym or spa needs a professional cleaning service that is certified to use hospital-grade disinfectants and the best commercial cleaning equipment. Colds, flu and other infectious germs – including MRSA – can be spread to your members and guests when they touch dirty, contaminated surfaces. People go to your fitness facility to get healthier and in better shape, not to contract an illness or skin infection. The Menage Total Program helps prevent the spread of germs. Fungus and mold breeds in warm, damp places commonly found in fitness facilities. Showers, sink areas, locker rooms, saunas, and piles of wet towels are ideal for fungi to grow. 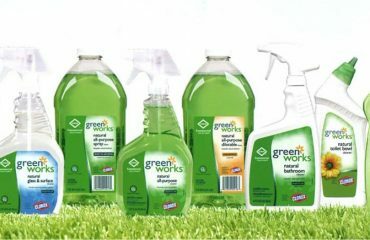 A commercial cleaning company certified to deliver the Menage Total Core 4® Process uses hospital-grade disinfectants and proper fitness center cleaning techniques. Since MRSA and many other infectious organisms can be spread by touching contaminated surfaces, Menage Total Franchised Businesses use hospital-grade disinfectants and color-coded microfiber towels and mop pads to properly clean surfaces, floors, restrooms and locker rooms. 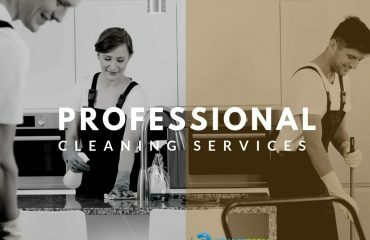 Advanced cleaning techniques focus on disinfecting high touch points that are often overlooked by other gym and fitness center janitorial services. A clean facility can differentiate your business and keep members coming back. Menage Total franchised commercial cleaning services are provided by local, independently owned and operated franchised businesses trained and certified to use Menage Total Program processes and brand.